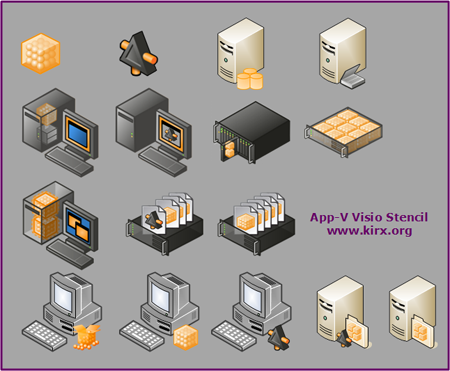 Inspired by The Data Dr's Visio Stencil for SoftGrid, I was thinking about updateing them a little for quite a long time - mainly because the "old" SoftGrid logo (the Blue Star) is not used any more by Microsoft. You may use, re use, modify and deploy this Stencil and of course you may us it for your Drawings. Do not deep link to the file itself. Instead, link to this web page. Documenting sequencing processes is a very important - but often neglected - task for a sequencing engineer. Creating a sequencing how-to for an application package allows to reproduce sequencing steps later on and to find possible issues. The "Sequencing How-to Template" collects lots of the information that might be important to re use an application package or to create a new App-V package based on an older how-to guide. It contains fields for each value that normaly has to be entered or modified during sequencing with space to make notes about unexpected tasks. The original idea came from the old "SoftGrid Sequencing Recipe Template" that was provided by Softricity in the past and never seemed to be updated and published by Microsoft. You may use, re use, modify and deploy this template and modified (filled in) copies of this template. However, you are obligue to mention this website (www.kirx.org) or me (Falko Gräfe) as the original source.